Eva Schubert is the founder and mastermind of the international association Museum With No Frontiers (MWNF) and, since 2005, its chairperson. A specialist in multilateral project design and management, she is the instigator of all MWNF projects and the creator of the MWNF methodology. Her main initiatives within MWNF are the Virtual Museum projects Sharing History, Discover Baroque Art and Discover Islamic Art and the Exhibition Trail and related publishing and travel programme Islamic Art in the Mediterranean. In 2010 she initiated the Memorandum of Understanding between MWNF and the League of Arab States, following successful cooperation between the two organisations at the Expo 2010 Shanghai. Her many years of experience in setting up and handling European Union funded projects led to the development of the pioneering methods for transnational project management that distinguish all MWNF activities. 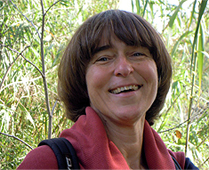 The foundation of MWNF was preceded by Eva Schubert’s involvement (1994–1995) in the preparation for the Barcelona Declaration* (cultural cooperation), as a result of her efforts to transfer to the Mediterranean region the successful experience of an innovative cultural tourism programme she had set up in the Austrian region of Tyrol (Tyrolean Exhibition Trails, 1994–1996). Eva Schubert’s pre-MWNF professional career was marked by a progressive transition from cultural entrepreneurship and institutional bilateral cooperation to independent multilateral project design and management. After studying drama in Vienna, she ran her own theatre company in Austria before moving to Rome in 1980, where she organised in 1983 the first and so far only performances outside Austria of the Salzburg Festival. From 1984 she was in charge of the summer tours of the Austrian State Opera Ballet and the Austrian Popular Opera until being commissioned, in 1988, by the Austrian Ministry of Foreign Affairs to undertake the elaboration and overall coordination of the cultural programme for the big events of 1992 (Expo Sevilla, Expo Genoa, Madrid European Cultural Capital and Barcelona Olympic Games). At the same time, the Italian Music Council appointed her as international relations manager of the European project “Mozart’s European Journey”, on the occasion of the bicentenary of the composer’s death in 1991. In this position she set up institutional relations with 75 “Mozart-cities” in under six months and organised an international Mozart singing competition involving the opera houses of Venice, Prague, Munich and Vienna. The flagship project of Austrian–Spanish cooperation in 1992 was one of the first international art exhibitions, which she managed on behalf of the Austrian Ministry of Science and Research in cooperation with the Spanish Ministry of Culture, in two venues, Toledo and Innsbruck. As a result of the success of this double exhibition project Eva Schubert was invited to continue working in the Austrian region of Tyrol where she set up the cultural tourism project referred to earlier; and she never lost her close ties with Spain, where MWNF was based in Madrid between 1998 and 2001 to implement its first European Union funded project. Between 1994 and 1996 she also initiated the European contemporary music and dance project “Donauballett” combining classical dance traditions in central European countries with new choreographic experiences in other European countries, namely the Netherlands and France. She is frequently invited as lecturer on topics relating to multilateral cooperation and to her experience with MWNF. Eva Schubert’s mission is to build bridges through knowledge and understanding by promoting a transnational presentation of history, art and culture, based on equal voices and the equal visibility of all concerned. *Barcelona Declaration (Nov. 1995) - establishes the formal partnership between the European Union and the Mediterranean countries of North Africa and the Middle East.